Mary Ellen Sinnott, front, recently completed a term as battalion commander of UA Army ROTC. Mary Ellen Sinnott’s time at The University of Alabama has been filled with more opportunities than she could have imagined. Sinnott holds a bachelor’s degree in chemical engineering from UA and will soon complete her STEM-focused MBA. She’s interned and held co-op positions at coal and nuclear power plants. 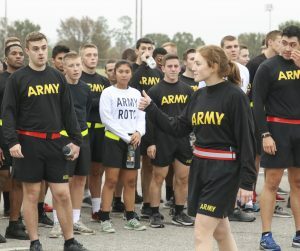 She met former Secretary of State Ashton Carter, competed for UA’s Army ROTC Ranger Challenge team at the United States Military Academy and recently completed a term as battalion commander of UA’s Army ROTC program. And to think, she almost went to the University of Tennessee. 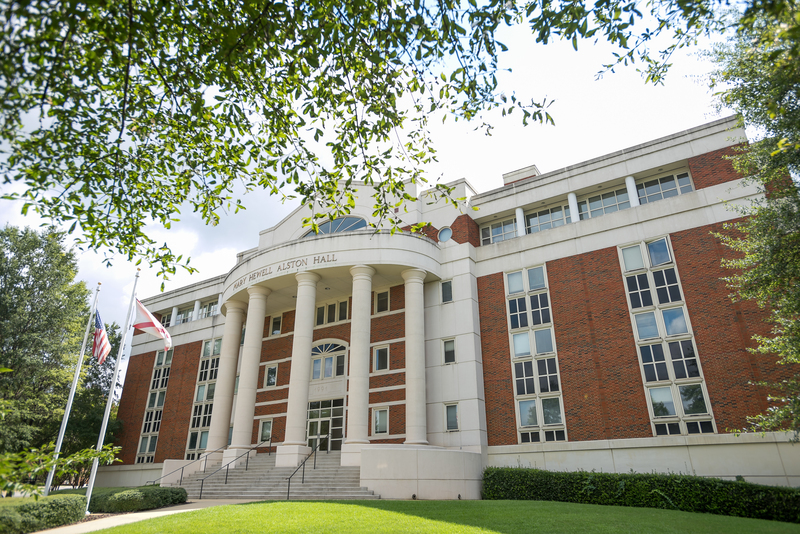 Sinnott, a Scottsboro native whose father, James Sandlin, is a UA engineering grad, ultimately chose to attend UA because of a delay in out-of-state scholarship money to Tennessee. “At the time, I just wanted to get out of Alabama and have a different experience,” Sinnott said. “I’d lived my whole life in the same town, and I knew everyone in my graduating class. Sinnott hasn’t looked back since enrolling at UA, continually challenging herself to be better prepared for ever-evolving engineering industries and to serve in the U.S. Army. From enrolling in the STEM Path to MBA program to earning a scholarship with UA Army ROTC, Sinnott has maximized her college experience to gain an “edge,” both personally and professionally. Sinnott started cultivating her “edge” as an undergraduate in the STEM Path to MBA program, while completing internships and co-ops at Alabama Power and Southern Nuclear. She was motivated to learn how business and engineering work together after learning from her father’s work in helping bring high-speed internet to Scottsboro in the 1990s. Through STEM Path to MBA, which allows select undergraduates to complete coursework toward the MBA, Sinnott worked in teams to address real-world industry issues. By her first year of graduate school, she’d completed a project for Home Depot to help resolve supply chain issues at its distribution centers. Sinnott said the Stem Path to MBA program challenged her to “think differently” to solve problems, and also improved her interpersonal communication skills. ‘With all the teamwork and projects, it’s made me 100 percent more confident in my professional presentation skills.” Sinnott said she will apply for both engineering and supply chain jobs when she completes her MBA. Engineering and STEM Path coursework, projects and internships weren’t challenging enough for Sinnott, who sought to replicate the camaraderie, competition and challenges of sports she’d played throughout high school. 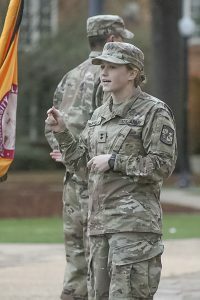 Club sports at UA could have been an option, but Sinnott opted for Army ROTC after her final co-op rotation during her junior year. To that point, she already had a job offer in hand and had considered entering the workforce, but she wanted to finish her MBA and further develop herself as a leader. “I wanted to serve my country, but I also wanted to feel like part of a team again,” she said. Sinnott would earn a two-year ROTC scholarship that kicked in for her first year of graduate school. That scholarship was nearly jeopardized almost two years ago when doctors detected a benign tumor on her frontal lobe. The circumstances of discovering the tumor were bizarre; doctors said it had been growing for 15 years, and Sinnott never felt symptoms of the growth, aside from a single migraine several years ago. It wasn’t until a chiropractor recommended an MRI that Sinnott would learn the “terrifying” news. She said anyone that has a tumor excised in the previous 12 months before entering the military could be medically disqualified from service. But after a medical reevaluation from the Army last fall, she was cleared and remained on scholarship. Sinnott is set to join the Army Reserves when she finishes her MBA. She’ll move to Fort Hood, Texas, where she’ll reunite with her husband, Brandon, an Army officer and UA grad whom she met in Army ROTC. She said she debated for two years over reserves or active duty, but the time commitments of dual active-duty couples led her to choose the former. Sinnott is eager to enter the workforce, knowing she’s prepared for a variety of professional and personal challenges. She credits ROTC with providing her with that preparation.